Larry James has been at the heart of the Columbus business, legal, civic, and political scene for the last thirty years. He is a respected litigator, as well as an advisor to local and national leaders. In recognition of his many achievements, the law firm changed its name from Crabbe, Brown, Jones, Potts & Schmidt to Crabbe, Brown & James in January 2001. In 2011, The Ohio State University selected Mr. James as lead counsel to represent its student athletes in NCAA investigations. In 2013, Armen Keteyian published his book The System: The Glory and Scandal of Big-Time College Football, a chapter of which is dedicated to Larry’s work in representing the OSU football players. In 2012, Mr. James and his wife, Donna, were awarded the American Red Cross of Greater Columbus’ Humanitarians of the Year Award. In 2015, noted journalist Wil Haygood published his award-winning book Showdown: Thurgood Marshall and the Supreme Court Nomination That Changed America, which he dedicated to Mr. James. 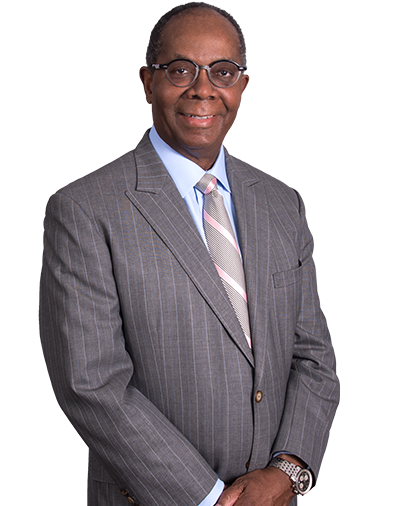 Mr. James is a life member of the Sixth Circuit Judicial Conference, and he has served as General Counsel of the National Fraternal Order of Police since 2001. He is also co-founder of the African-American Leadership Academy and a member of the Board of Trustees of Kenyon College.